Outraged family members and community groups are accusing a Muslim group of trying to rewrite history with its plans to build a 13-story mosque and cultural center just two blocks from Ground Zero, where Islamic extremists flew two planes into the World Trade Center on Sept. 11, 2001. "This is a place which is 600 feet from where almost 3,000 people were torn to pieces by Islamic extremists," said Debra Burlingame, whose brother died in the attack on the Pentagon that day. It was aired on Friday night at 5:30 PM PDT and turned out to be an excellent interview, really professional. The hosts, Rory and Wendy, are gracious and delightful. Just a simple, straightforward interview that freed David to take his time to explain things. Part 2 will be shown live this Friday at 5:30 Pacific, 8:30 PM Eastern. 15 years later, it's important to ask: What Really Happened? Good opportunity to spotlight this news local news footage which was never broadcast again, just like the reports of explosions on 9/11. If you haven't seen this footage before, brace yourself. 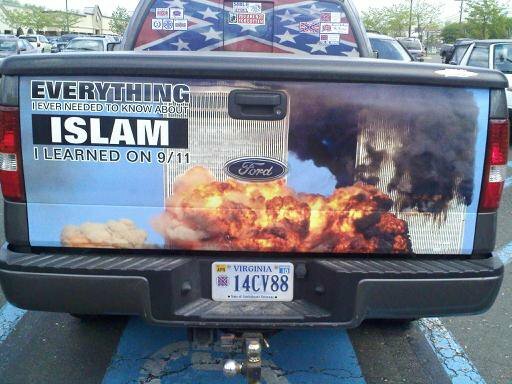 Car with an Islam 9/11 message: How do you react? What's with the California air? Is there something in the air out there that yields such progressive, freedom loving, free thinkers? MASSIVE freeway support for 9/11 truth. Virtually non-stop honking. Griffin's next book to focus on "cognitive infiltration"
David Ray Griffin comes to Drake University on April 23 to tell us why the official explanation for the 9/11 attack on the United States doesn't hold water. A theologian, philosopher of religion and professor emeritus at California's Claremont School of Theology and Claremont Graduate University, Griffin has been at it for about seven years now and says he won't stop until the government conducts a new, impartial, independent investigation. As opposed to the 9/11 Commission probe. He calls that exercise a charade. Griffin has written eight books on the subject with another on the way: "Cognitive Infiltration: An Obama Appointee's Plan to Undermine the 9/11 Conspiracy Theory." While I was not initially impressed by the debunking efforts of Popular Mechanics, I was recently turned on to two sites: debunking911.com and 911myths.com. These sites go far more in technical depth than Popular Mechanics. Also, David Ray Griffin's critique of the NIST report in "Debunking 9/11 Debunking" was thoroughly destroyed by NASA scientist Ryan Mackey. Each and every claim of the movement is thoroughly scrutinized and debunked. If certain claims are not debunked, they have been at the very least cast severe doubt upon. For example, when Silverstein said to "pull it," he was not talking about the building, he was talking about the contingent of firefighters within the building. They reveal how thermite does not cause loud bangs and explosions, and therefore the thermite theory does not support the testimony of explosions. People don't realize that in a fire of that magnitude, you're going to have coffee machines blowing up, and microwave ovens blowing up. So of course people are going to hear explosions! So-called "truthers" don't seem to acknowledge these points as they contravene their pet theory. An e-mail from a friend; thoughts on a good reply? I received the following e-mail from a good friend and anti- Drug War activist. Now before you think, "Oh, come on Adam! Don't you know your 9/11 stuff better than this?" my main reason for posting this is that my friend is definitely on board with 9/11 truth, but seems to think that the military should have been on the scene immediately, including on the ground at the WTC. His friend emphasized the city/state sovereignty issue. I have been questioning the lack of military response during the events on 9/11/01. I totally do not understand where the military was on that day at all. Recently, I mentioned that to a gent I was talking to and he said that it has to do with the sovereignty of the states and the governor of the state of New York, nor the mayor of NYC ever requested military response. I am curious about this and wanted to delve into the issue and look further into other events that happened in U.S. history such as the black riots during 1964, and even Kent State in May, 1970. A ruling Democratic Party of Japan lawmaker who was criticized by The Washington Post for what it described as a ‘‘bizarre’’ conspiracy theory on the Sept 11, 2001, terror attacks received a stern warning from a senior DPJ lawmaker on Thursday. DPJ Administration Committee Chairman Tenzo Okumura told Yukihisa Fujita, who serves as director general of the International Department of the DPJ, to watch what he says given the importance of his post, according to a participant at the meeting. In its editorial dated March 8, The Washington Post presented Fujita’s views on the terror attacks, including his argument that some hijackers remain alive and that ‘‘shadowy forces’’ with advance knowledge of the plot profited from stock trading.